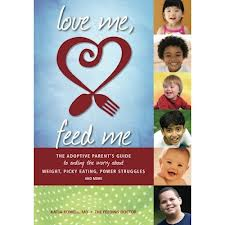 Love Me, Feed Me is a comprehensive guide to solving childhood feeding struggles and weight concerns. Although written specifically for foster and adoptive parents, Love Me, Feed Me is relevant and beneficial for any type of caregiver dealing with feeding frustrations. Elaborating on Ellyn Satter’s “Division of Responsibility,” Love Me, Feed Mepresents the “Trust Model” of child feeding and examples to help with its implementation. The basic premise: given appropriate structure and a pressure-free environment, children can learn to eat competently and self-regulate their intake. Simply put, adults are guided to prioritize how children eat over what they eat. Additional focus is given to specific concerns often observed among foster and adopted children, such as special needs, sensory issues, food obsession, and selective eating. Eating disorder dietitians already appreciate the critical importance of the “how” of eating, so although Love Me, Feed Me is not about eating disorders, per se, it can reinforce and support our teachings and recommendations in the minds of the parents of our youngest patients. It is also an invaluable reference for new dietitians and any provider who works with children and parents (foster, adoptive, biological, or any combination thereof) with feeding or weight concerns. The author, Katja Rowell, MD, is a primary care physician turned childhood feeding specialist. In her medical practice, she grew frustrated with the failure of conventional medical advice to help individuals and families correct problems (real or perceived) with eating and weight concerns. She ultimately left her medical practice to focus her attention on helping families establish healthy feeding relationships. Dr. Rowell’s casual, conversational writing style and her message of encouragement and validation make this an easy cover-to-cover read. The reader in a hurry can use the comprehensive index to find the most pertinent and useful information. Love Me, Feed Me also provides a wealth of information in appendices, for example Medical Issues That Can Affect Feeding; Tips for Dealing with Health Care Providers; and Snack and Meal Ideas. This book is a must-read for foster and adoptive parents at any stage along the parenting journey. It will also be immensely useful for any parent struggling with a child’s feeding or weight and dietitians looking for another voice that supports the goal of developing internal guidance and “competent” eaters. Love Me, Feed Me is available in paperback for $17.95 here: http://amzn.to/11f0Fip. The Kindle version is available for $9.99 here: http://amzn.to/141NbYp.